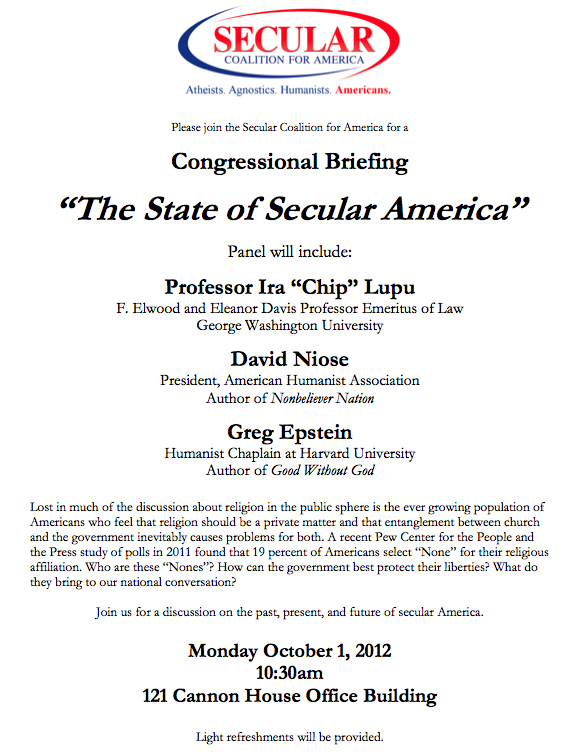 The Secular Coalition for America is having its first-ever Congressional Briefing this Monday, October 1st at 10:30a. Lost in much of the discussion about religion in the public sphere is the ever growing population of Americans who feel that religion should be a private matter and that entanglement between church and the government inevitably causes problems for both. A recent Pew Center for the People and the Press study of polls in 2011 found that 19 percent of Americans select “None” for their religious affiliation. Who are these “Nones”? How can the government best protect their liberties? What do they bring to our national conversation? Join us for a discussion on the past, present, and future of secular America. The Briefing is intended for Congressional staff and Members of Congress — how many will actually come is up in the air — but it’s open to the public. There will also be a panel discussion at the meeting, featuring Professor Ira “Chip” Lupu (George Washington University Professor Emeritus of Law), David Niose (American Humanist Association), and Greg Epstein (Humanist Chaplain at Harvard University). If you can make it, this is one of those events where a strong showing would make for great press.